Wood windows prices vary dramatically in price, but usually range from $350 to $1,050 fully installed. Hands down the most beautiful material for use as a frame. 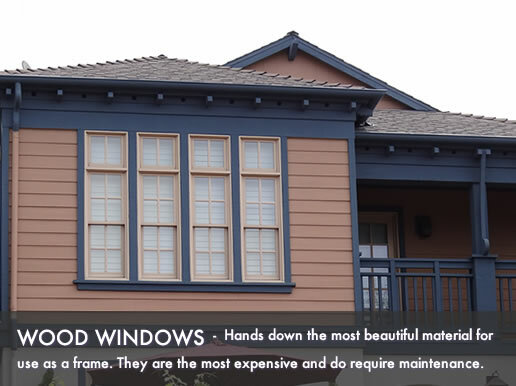 They are the most expensive type of replacement window and do require maintenance. This page will offer you an idea on Cost To Install The Window, window pries and the total prices you can expect to pay when looking at wood windows. For more pricin,g see our project cost estimator. Entry level wood windows prices vary between $200 and $325. They often include a low-E glass package with a double pane of glass which can be single hung, slider or fixed frame in design. These windows may be available from your local stores such as Lowes or Home Depot. For additional costs and pricing, use our project calculator. The mid-range wood windows prices vary between $325 and $450. You'll be offered a better energy efficient glass package which is a low-E glass with krypton or argon fill and uv coating. There is a wider selection of styles available including double hung, casement and awning options. These windows are usually offered by the mid-range manufacturers. Higher end wood windows prices range between $450 and $900, but this includes a good glass package complete with uv coating, foam insulation, low R and U values and super spacers. These windows usually come with a lifetime warranty which may include installation (depending on whether you used the manufacturer for the installation). Installation of windows varies between $50 and $250 for each opening. The price is determined on how easy the window is to install. If your window just need a basic replacement then you can expect to pay a lower price, if you need standard replacement or full frame replacements, expect to pay the higher end of the scale. Inserts range between $40 and $100, standard installations costs between $100 and $150, full frames can cost around $175 to $250, while a complete tear out will cost you in the region of $250 and $550. Entry level pricing start at $250 and top out at $400 for each installed window. Homeowners may want to think hard before buying a low end wood window due to the fact that their performance numbers might not be that impressive -- most contractors would recommend going with a mid or high end vinyl or fiberglass or upgrade to a mid grade wood model. Mid-range pricing start at $400 and top out at $700 for each installed window. Higher end pricing start at $700 and top out at $1,200, though some projects can go above this price.